The French Riviera exudes a contrast of both natural and superficial beauty up and down the coast. From some of the most stunning natural beaches and islands, to the most over-the-top villas, cars, and designer attire, the French coastline possesses a truly alluring and unique charm. Cannes is one of the most famous villages within the French Riviera, for its famous festivals and conferences, expensive taste, and the luxurious Cannes rentals that make for an unforgettable stay. 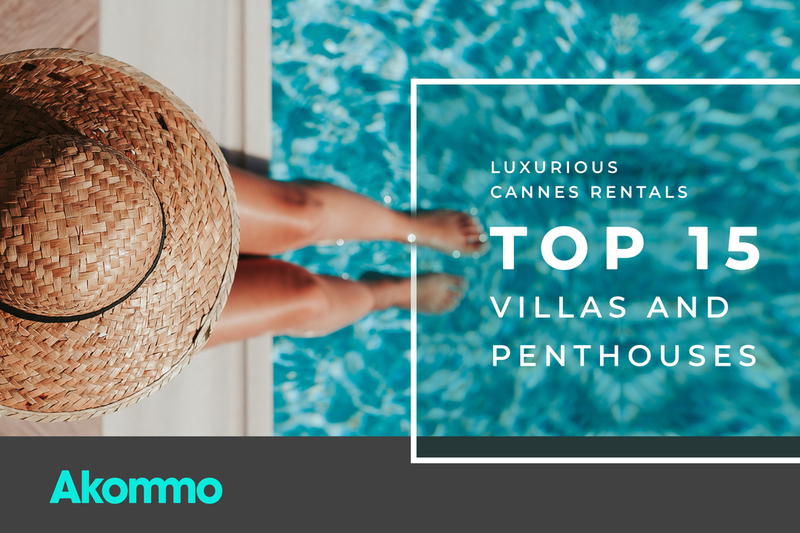 Today we're sharing the mostLuxurious Cannes Rentals - Top 15 Villas and Penthouses. Let's take a look into the lifestyle of the rich and the famous, shall we? If you rent out this Cannes downtown party villa and do not throw an epic cocktail party on its breathtaking terrace, then unfortunately, you're not quite doing it right. 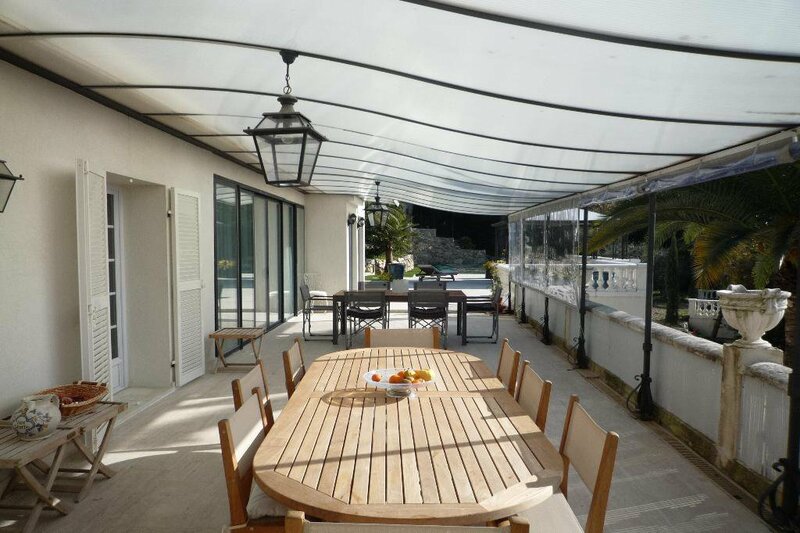 Ideal for barbecues, corporate meetings or even private group events, this Cannes villa makes for an ideal party HQ. With its spacious living room, outdoor deck with relaxing area, and a terrific rooftop, it has a great setup to entertain up to 50 guests. Be sure to buy extra rosé, because you're guests are going to want to stick around to enjoy the views of the tropical palm trees and take in the warm French sunshine. The outdoor deck with pebbles has 2 separate sitting areas and direct access to the rooftop. 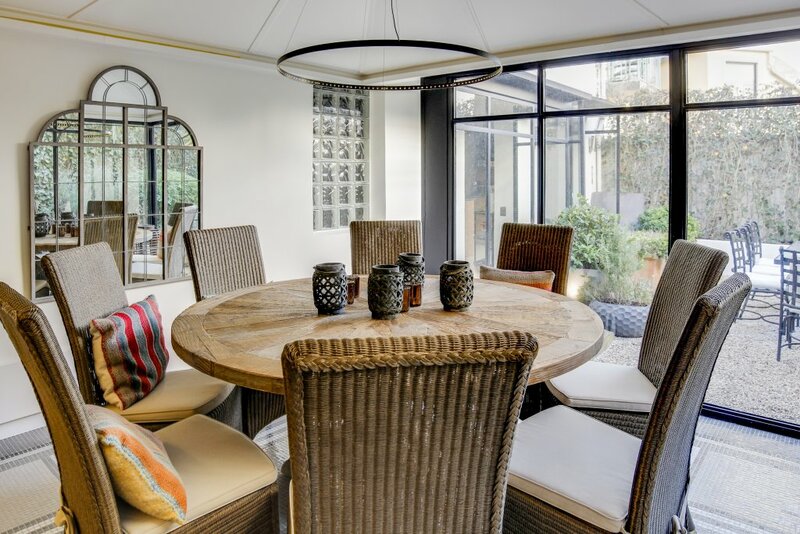 The indoors of this Cannes townhouse provides a warm and inviting atmosphere, and each bedroom has its own relaxing area and is large enough to even be mistaken for a studio! Added bonus - Located just a 15-minute walk to the Palais des Festivals and an 8-minute walk to the Carlton Hotel, you'll be able to enjoy your privacy while remaining close to the city centre. It should come as no surprise as to why this villa is one of the most preferred accommodations among the celebrities travelling to the French Riviera for the prestigious Cannes Film Festival. Located just on the Cannes outskirts, in an upscale and private neighbourhood, this is a perfect rental villa for anyone who is looking for an exclusive, secure and luxurious Cannes rental experience. An outdoor deck surrounding the private swimming pool and garden spaces of 600m2 make up for a chic event and party venue. The interior of this Cannes 3-storey rental villa with a swimming pool is as charming and appealing as the exterior. The next time you're looking to host a celebrity party during the Cannes Film Festival, be sure to keep this villa on the top of your list. Located in the prestigious Californie Pezou, a neighbourhood set on a hill and famous for its lavish villas with views of the Bay of Cannes, this Cannes luxury villa is spread over a whopping 2500m2 of private ground space. Strategically built to imitate the experience and atmosphere of a luxury resort, this Cannes private event villa was made to help all who enter its doors experience the French summertime in style. Constructed on the slope of a hill, the gardens stretch on different levels with viewpoints offering breathtaking vistas of the sea and surrounding hills. This event villa comes with a swimming pool, a pool house, a gaming room, a private gym, and a Jacuzzi. With a capacity for up to 300 guests, it's perfectly suitable to host any private ceremony, corporate event, a venue wedding or a glamorous party. We mentioned we'd be giving you insight into the lifestyle of the rich and famous, right? One of the true simple pleasures in life is waking up to the view of the Mediterranean Sea, which can be enjoyed from almost every spot in this Cannes penthouse. It is a perfect combination of tasteful interiors, an unbeatable location and a magnificent private terrace. This event penthouse is located on the famous Boulevard de La Croisette, which goes along the coastline of Cannes and is home to some of the French Riviera's most luxurious designer shops, Michelin-star restaurants and 5-star hotels. Here's how we recommend fully enjoying this Cannes event rental penthouse: dock your yacht on the port, cross the Croisette to get to your apartment, pour yourself a glass of French wine, head straight out onto the terrace and enjoy unobstructed Mediterranean views while relaxing on the outdoor furniture. The modern design of this Cannes penthouse elegantly compliment the classy terrace with sea views. The spacious living room and the terrace would make a perfect spot to host a VIP dinner party, a C-Suite business meeting, or even to host an intimate cocktail networking event. This spectacular mansion-styled villa is not just a regular villa with a pool - it's an exclusive paradise on the French Riviera! Located in Le Cannet, a private and prestigious commune situated in the north of Cannes, with spectacular sea views. The neighbourhood of Le Cannet is famous for its art-deco mansions and great outdoor restaurants, lounges, and bars. The entire property covers over 3000m2 of land, and is at a distance of merely 4 km, or a 15-min drive, from Cannes centre. Wake up in the morning, walk out of the living room, rejuvenate your mind, body and soul by taking a dip in the swimming pool or a stroll in the garden while breathing the fresh mountain air. The rental villa is divided into 2 buildings, hosting 8 bedrooms total for you and a large group. Apart from the exclusivity and other high-class amenities it offers, it also has a laundry room, a ping pong and Foosball table, barbecue area, garden and lounge furniture, a piano in the living room, and a high-tech security system so you can rest at ease every night in the comfort of your private oasis. Designed professionally with attention to each detail and quality crafting, this is indeed a one-of-a-kind Cannes duplex penthouse. The rooftop terrace is covered by an automated pergola and consists of an extraordinary glass-enclosed swimming pool, a 5-person Jacuzzi and comfortable lounge furniture. 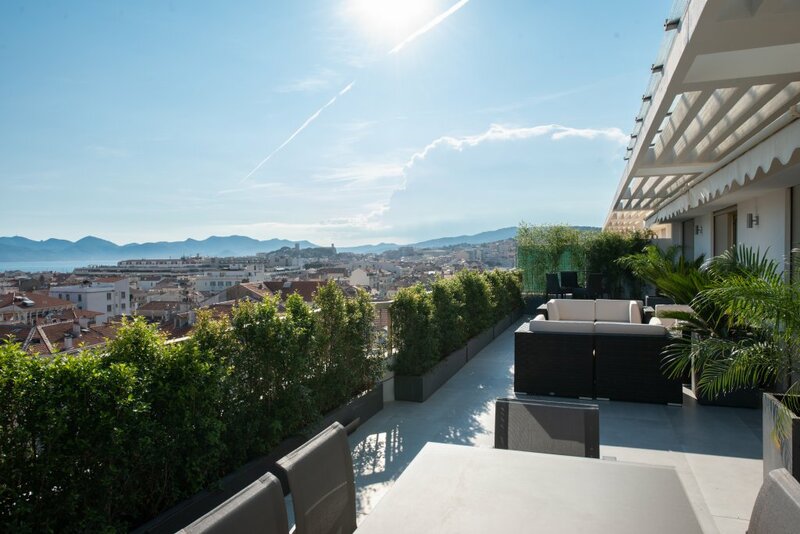 This unique penthouse terrace makes for a perfect spot in Cannes to entertain an event for up to 100 people in the heart of the city. Additionally, this penthouse and apartment complex is often used to host the C-Suite leaders of major companies, to host VIP networking cocktails, and even for formal luncheons by the pool. The penthouse itself is a part of 5 apartments (two generously-sized studios and two formal one-bedroom apartments) divided over 3 floors of the same building with a capacity to accommodate a group of 16 guests and can be rented out collectively or separately. Located in the Cannes centre on Rue Louis Ardison and surrounded by high-end shops and restaurants, one simply can’t go wrong with this penthouse. Grab onto something tight before you scroll any further, because this luxurious Cannes rental villa was made to sweep you off your feet. As trendy as they come, the entire villa is a masterpiece of artistry and craftsmanship. Built in a classic fashion with unique yellow stone walls, the extensive living rooms open up to a front deck with a stylish swimming pool, a shower and barbecue area so you can enjoy the French weather to the fullest. There is a personal office next to the living room on the ground level of this villa, which is the ideal area to conduct an important business meeting. You will never run out of options to entertain yourself while staying in this villa. 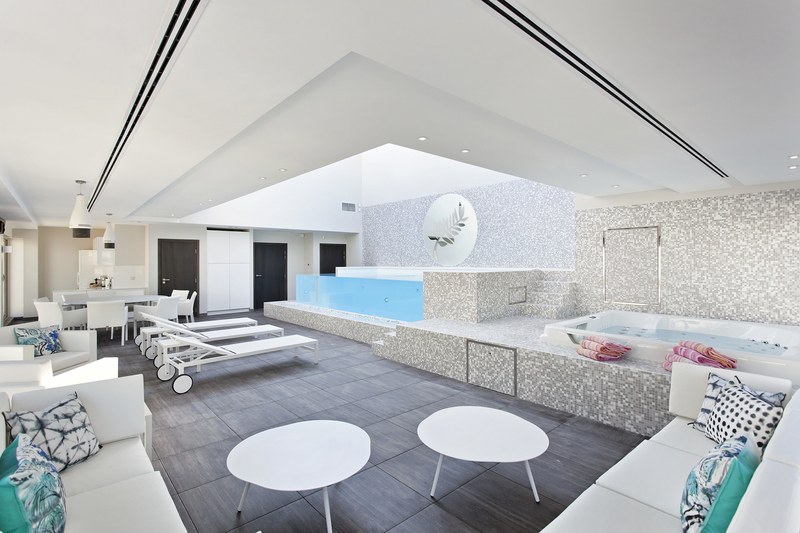 Pop open some local French bubbly and cool off in the indoor 5-person Jacuzzi on the first floor. In the mood for something a little less adventurous? Why not enjoy your favourite movie in the private soundproof home theatre in the basement. This is truly one of the most spectacular villas in Cannes, and is a great option for a group of 6 or more. Looking for a larger Cannes venue for your next event? Fill out your event requirements here, and we'll be back within 24 hours with a no-strings-attached proposal. Remember the iconic Wayne Manor? Let's see if this rings a bell - the personal residence of multi-millionaire Bruce Wayne aka Batman located in the legendary city of Gotham. Bienvenue à la French version of Wayne Manor located in the much safer neighbourhood of Petit Juas (one of the 10 Cannes districts). Covering a staggering 750m2 of constructed space and another 2250 m2 of lush green gardens with a heated swimming pool, barbecue stand, and a separate maintenance house, this Cannes luxury villa is the epitome of luxury and wealth. A stunning entrance opens up to the ground floor, comprising of an imperial style living room with a handcrafted fireplace, a formal dining room, a spacious library and a pool/billiards room. There are 9 bedrooms distributed over the 1st and the 2nd floor this 3-storey Cannes rental villa. To get the full experience, we strongly recommend you have a look at this villa for yourself. 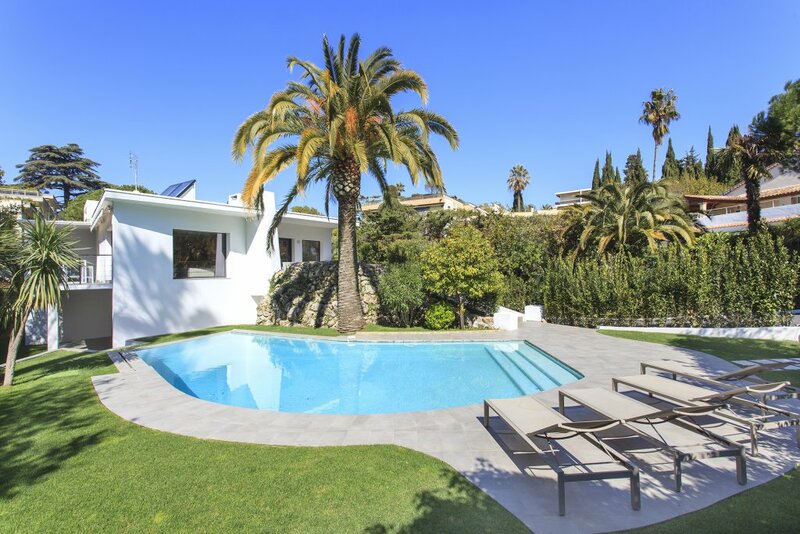 Get that rest and peace that you deserve with this serene and peaceful Cannes villa. Exquisite design and 21st-century luxury have been impressively blended together in this gorgeous Cannes group villa. 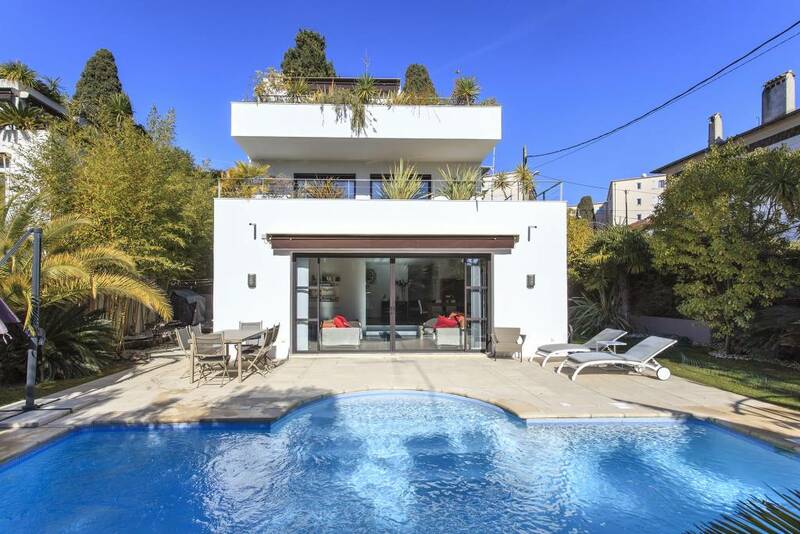 Located in one of the most private districts of Cannes, Californie Pezou, this chic villa is at a distance of less than 2 km from Palais des Festivals. Enjoy a refreshing splash in the swimming pool or bask under the sun on one of the sunbathing chairs in the lush green gardens with graceful palm trees. Particularly suitable for any group event, a cocktail party or even a private ceremony. The modern interior features smooth and glossy wood finishing as well as plush couches in the living room with pleasant views from the glass walls. The villa also has a personal gym, and the first floor bedrooms open up to a sunny terrace with outdoor couches for relaxing. What could possibly be better than a Cannes sea-facing penthouse on Boulevard de la Croisette? 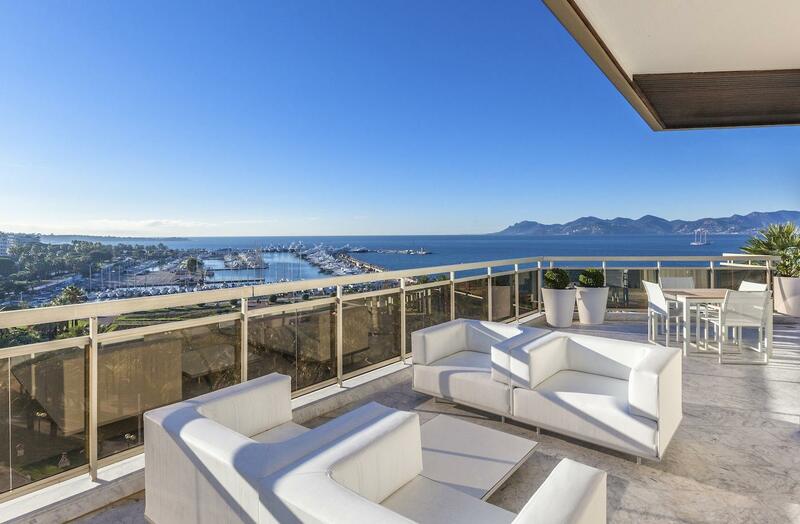 A Cannes sea-facing DUPLEX penthouse on the Boulevard de la Croisette. Breathtaking views of the Mediterranean and the bay of Cannes from the terrace and the bedrooms guarantees an unforgettable stay in this Cannes group accommodation. A grandly styled first level opens up with a charming living room, a fully-equipped kitchen and a sweeping marble staircase that takes you to the second level of this penthouse, where the bedrooms are. Sunset lovers – Be prepared to witness the magic of the seductive Cannes sky from this penthouse as the sunset over the sea brings out the most captivating pattern of colours you’ll ever witness. If you're attending an upcoming event like the Cannes Lions International Festival of Creativity, here's where you want to be staying, folks. 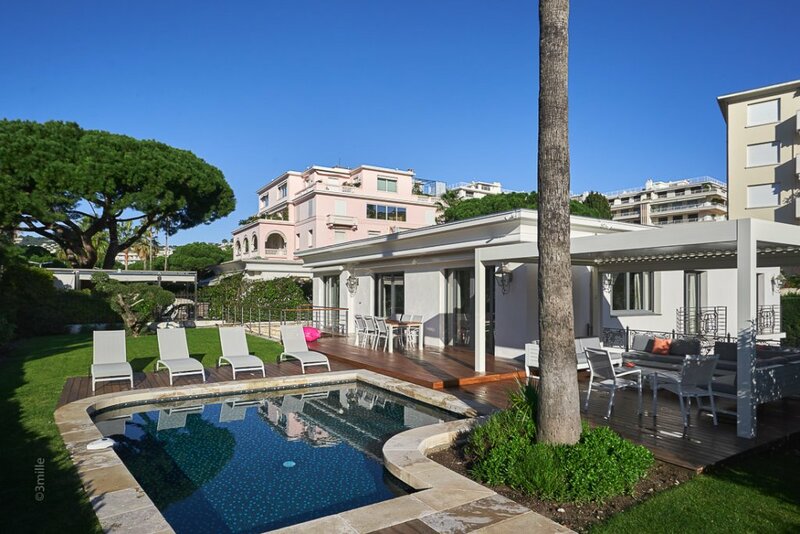 Fabulous Cannes group villa is located on the Pointe Croisette, the palm-shaded cape of Cannes, where the land meets the sea. 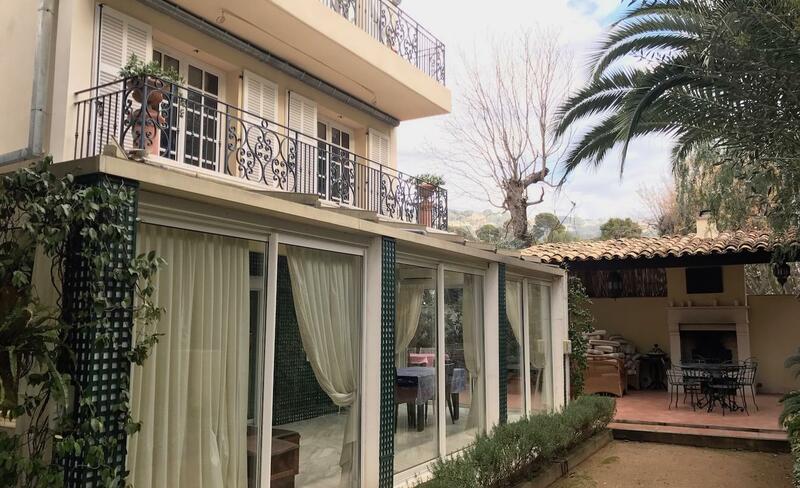 Surrounded by crowd packed seafront clubs, restaurants and bars, it is an ideal place to either throw your own private party or to seek peace and calm while being at a walking distance from the best action taking place on the French Riviera. The contemporary living room opens up to a bright turquoise swimming pool and an outdoor dining and relaxing area. Three bedrooms are spaciously laid out on the first floor of the villa with a beautiful terrace. The second floor consists of a master bedroom with its own private terrace. The entire property is gracefully decorated with trees and plants which handsomely adds to the beauty of this Cannes rental villa. If Tony Stark (Iron Man) were to travel to Cannes on a business trip, this is the penthouse that he would choose to spend the night in. It is a fact that the Ironman will take a fancy penthouse with exotic views over a villa any day. 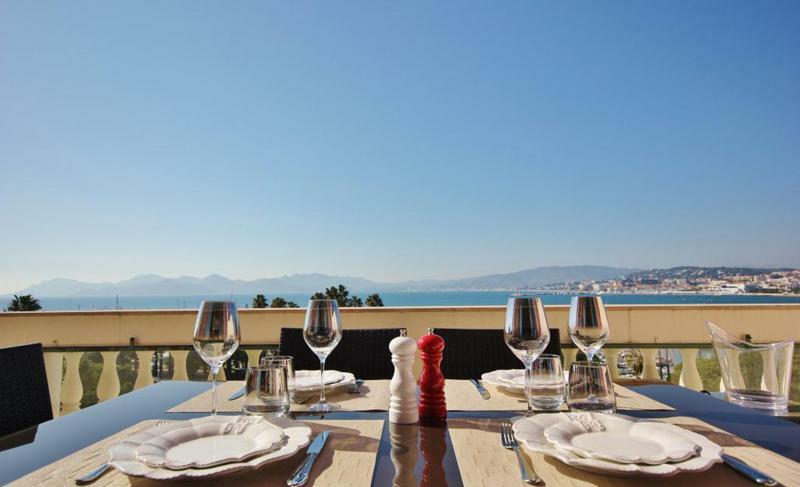 The 8th-floor terrace makes it one of the highest central viewpoints in Cannes and offers a picture-postcard sight of red-brick rooftops followed by the sea and the mountains in the distance. A highly sophisticated and elegant living room, that can be used for closed-door meetings, open up to the penthouse party terrace. This central rooftop with outdoor couches and dining area is the best private event space you will find in Cannes. The entire apartment is decorated with artistic paintings and all the 4 bedrooms of this Cannes penthouse comes with en-suite bathrooms. Turning off the holiday mode after staying in this astonishing Palm beach villa won’t be an easy transition for sure. Just steps away from the Cannes port and beaches, this party villa is positioned to enjoy the most fun and vibrant Cannes neighbourhood on the famous Boulevard de la Croisette. The living room opens up to the front deck lounge with couches and dining area, a spacious garden and a swimming pool offering views of the sea, perfect to entertain a private event gathering. The interiors are sculpted with exceptional craftsmanship and unparalleled amenities. We can only say that If interior designing is an art, then the designer of this Cannes villa is undoubtedly the master of this art. The entire villa feels like an art exhibition and is the ideal location to host a meeting and leave an excellent first impression. All the bedrooms come with double bed and open up to different gardens on the premises. And yes, there is also a massage room, if you want to take relaxation a notch higher. Ideal for a creative group attending an event or a conference in Palais des Festivals and knows how to throw a party. It consists of 600m2 of Garden space and an in house elevator connecting 4 levels of living space. The uniquely designed ground floor consists of 2 separate living areas, one covered and the other glass enclosed. Flaunt your dance moves in the basement bar equipped with high fidelity light and sound system. Cannes group villa is suitable accommodation for those who wish to spend some quality time with their friends or co-workers. The outdoor gardens have multiple sitting arrangements with couches, chairs and amenities of kitchen and barbecue. The bedrooms are divided into the top two levels of this party villa. 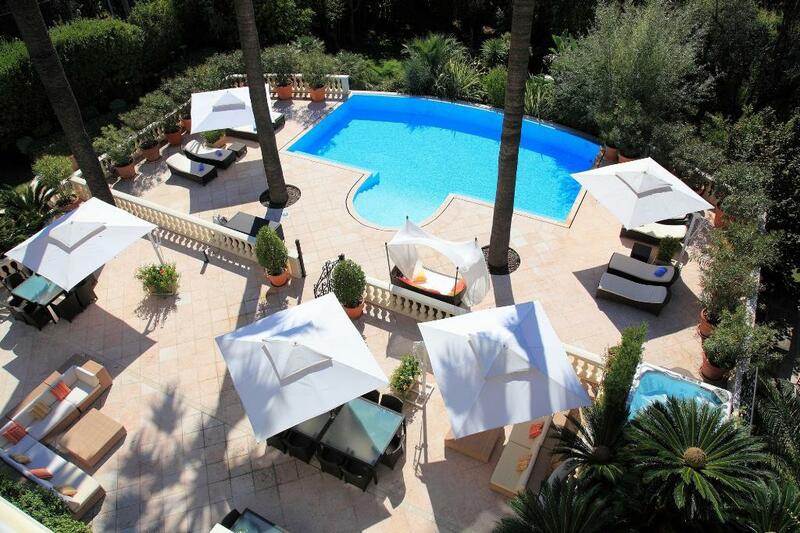 At a distance of 2 km from the Palais des Festival, stands tall this mammoth Cannes event villa. It is one of the top 5 biggest rental villas in whole France. Spread over 4000m2 of land and 1000 m2 of Mediterranean coloured construction, this massive French style villa boasts 14 bedrooms that can comfortably sleep 26 people, a heated swimming pool and a barbecue. The grounds of this estate consists of a beautiful veranda which gazes over the bay of Cannes and can seat 100 people, the elegant ballroom can host up to 200 more, which makes it the best corporate event villa in Cannes. There are 3 separate staff bedrooms in the basement to accommodate 9 staff members, whose services are included in the price of the villa rental. Still not convinced with these luxurious Cannes rentals? There's more where that came from. Get in touch today and we'll find a Cannes group accommodation that will blow you out of the crystal-clear blue French water. For all major group enquiries, send your requests to contact@akommo.com.